Can you share a brief overview of your roles? [Anita Stever]: My role at ACIST is to work with project teams (both new products and sustaining products) to create and coordinate labeling activities. Labeling can include device labels, package labels, instructions for use (IFUs), User’s Guides, and quick start guides. Additionally, I coordinate the translation activities as required for those products. As with all labeling activities, I must work closely with all other departments (regulatory, R&D, manufacturing engineering, software engineering, quality, etc.) to ensure the labeling meets all regulatory requirements and accurately reflects the product and processes used to create the labeling. [Sara Brouillette]: I work in the Product Labeling and Documentation department at bioMérieux, and I’m responsible for the global translation process for product documentation, as well as managing the relationships with translation vendors. [AS]: It was my intent to discuss how the selection process for a translation vendor in order to maximize success, how to work with in-country reviewers to make sure they understand their role, and the importance of having a good working relationship with the translation vendor project manager. ACIST recently went through a project to choose a new translation vendor and I am happy to share our method and tools. [SB]: It will be an opportunity to discuss how to establish effective and productive processes with vendors. What advice do you have for organizations who are trying to achieve successful partnerships with translation providers regarding these areas? [AS]: Before you start, determine the most important elements: price, speed, accuracy, etc. [SB]: Make sure you thoroughly evaluate vendors before choosing one. It’s important to not just select the first vendor you meet with. Finding and prioritizing criteria is necessary, and you may need more than one vendor depending on your needs. [AS]: Having a good relationship with the project manager in order to give and take accurate information so timelines are understood and met. [SB]: It’s critical to maintain regular communication with vendors especially when it comes to ongoing translation projects. [AS]: It’s important to make sure that the reviewers understand their role, the importance of it, and exactly what their reviews should consist of. When possible, make sure that the translation vendor selected has the tools in place to allow quick and easy review and approvals. [SB]: My suggestion is to establish a process that has contingencies in case of unpredictable roadblocks in in-country review. If a reviewer is unavailable, you need a backup plan to prevent or minimize delays. [AS]: By working with the translation vendor to select the right translators, and bringing the in-country reviewers into the selection process you can make sure the process works as smoothly as possible. [SB]: Take advantage of translation memories, and always look for ways to make the translation process more efficient without sacrificing quality and compliance. I also suggest tracking KPIs regularly so that you can recognize and address any negative trends. Are there any other best practices you think would be helpful for your peers to know? [AS]: GLOSSARIES!!! Making sure that reviewers understand their role, that they are not editors, but reviewers. Documenting the process. 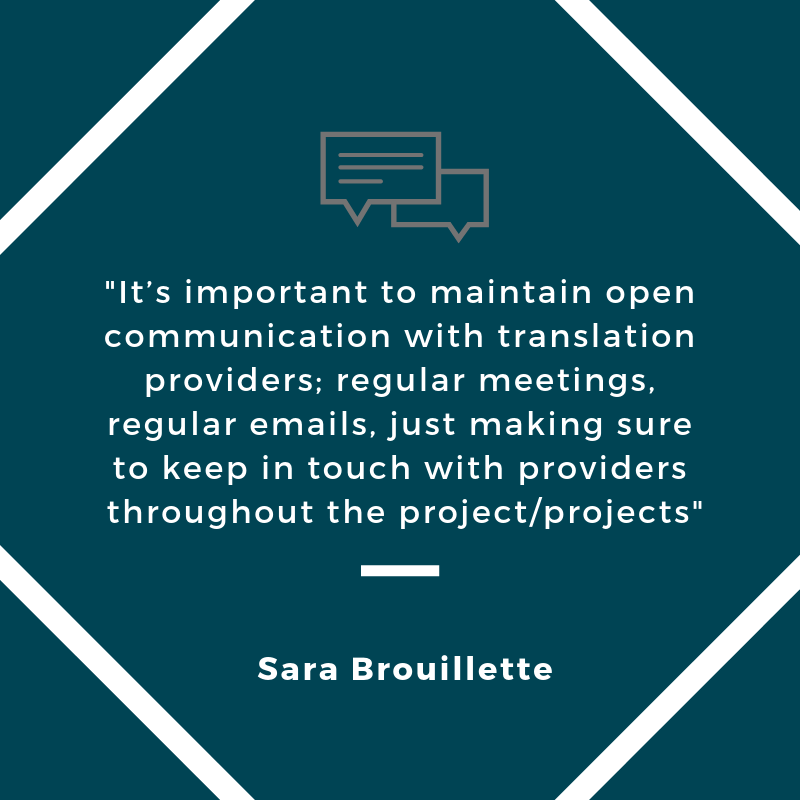 [SB]: It’s important to maintain open communication with translation providers; regular meetings, regular emails, just making sure to keep in touch with providers throughout the project/projects. Why do you think it’s important for labeling professionals to attend this conference? [AS]: The information shared is invaluable in understanding upcoming changes and requirements for labeling, from people who actually work hands-on in the labeling arena. Very good way to meet others in the industry and create peer-to-peer relationships. [SB]: We’re all facing the same challenges, whether you work at a small or large company, and it’s helpful to hear different perspectives on these topics that impact all of us.